If you don't have time to workout, you are not alone! I regularly hear from my students and coaching clients that they simply don't have time for traditional exercise classes. They are busy working and caring for their families, and self-care often falls to the bottom of the To Do List. I created The Healthy Moving Action Packs to help busy women like you! 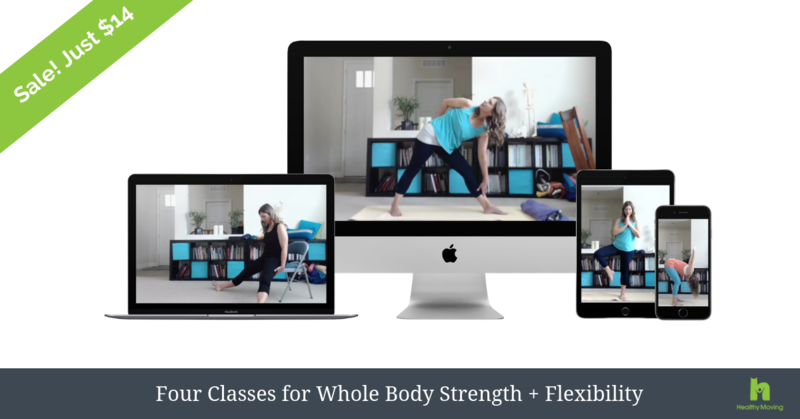 In the Texting Action Pack, you will learn simple exercises you can easily weave into your day to ease tension and build strength in the upper body. The exercises included are perfect for anyone who logs time on their phone! Finger Video Lesson: This exercise will address tension created in the fingers and hands while holding your phone. Wrist Video Lesson: This powerful exercise will help you release the tension that builds in your wrists and hands while texting with this exercise. Arm Video Lesson: Did you know that holding your phone for prolonged periods of time can change the alignment and function of your arms and shoulders? This exercise will help you restore healthy upper body alignment. Shoulder Video Lesson: This exercise will help you reduce the upper back and shoulder tension that comes from rounding forward toward your phone. Neck Video Lesson: Texting creates tension all the way up to the neck, and set you up for tension headaches or teeth grinding. Ease that tension with this exercise. Shoulder, Arm & Hand Mat Class: Roll out your mat for this 20-minute class to ease tension and build strength in the upper body. You will receive a welcome email with all of your course links and information. If this is your first Healthy Moving purchase, you will also receive an email with your username and password. Yup! This action pack (and the classes included) are part of the Coaching & Challenge Program member library. You can access the bundle or individual classes when logged in. Feel free to email support@healthymoving.com if you'd like direct links to the classes.